Do-it-yourself create business cards can beat professional ones, Create Business Card super easy - with Business Card Composer ! Create Business Card - Business Card Composer - Whatever your profession or interests, you communicate with people. Do they come back to you after the first meeting? Did you notice that business cards have the ability to bring the memories about the people you met and how that happened? We deliver you Business Card Composer - the best tool to create business cards and print excellent business cards, calling cards and badges. For a trade show you can create custom business cards to reflect special events and promotions (or just put on your booth number). Your phone or e-mail changed, and you can't wait until your company makes new cards for you. You need to create small runs of cards for temporary staff. You have several jobs and want to have a separate card for each. You want to create a nice card with your phone and e-mail to give to the people you meet. Localized in English, Japanese (from Act2),German (from Objectpark Software), Dutch (from Simon G Maasdam), French (from Pierre Bannier). 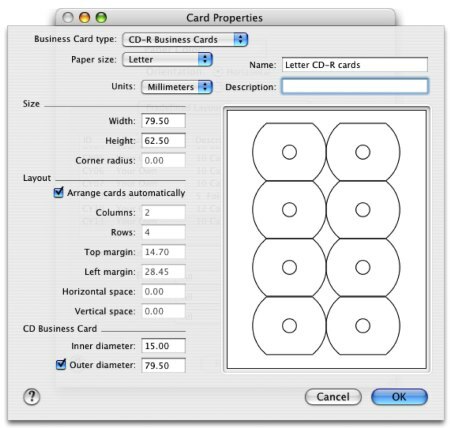 Create regular, folded, CD-R cards. - Apply more than 50 masks to images. - Control transparency, tint images with colors, rotate them. - Use clipart from built-in collections or select a custom folder. - Insert images in many supported formats - TIFF, JPEG, GIF, PDF, EPS and more. - Search images by keywords. Integration with iPhoto lets preview and use pictures from the iPhoto libraries. Search images in Google - right from Business Card Composer! A true Cocoa application, it takes all advantages and innovations of the Mac OS X system. More than 450 supported business card paper for ink jet and laser printers, from Avery, APLI, Decadry, Sigel, A-One and other manufacturers. Print the same card for selected people from your Address Book - great for ID cards and invitations. 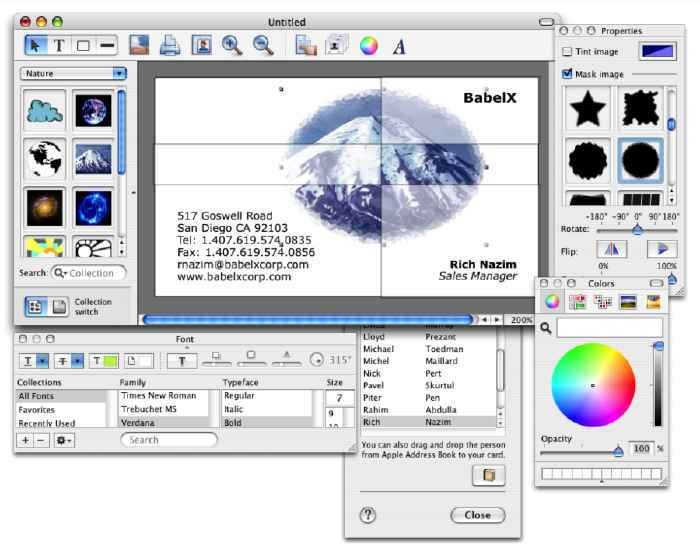 Customizable export to PDF allows to save your design in a format, appropriate for sending to a professional print shop. Cut marks can be printed - helpful for printing on non-perforated paper.